Congestion relief could be coming for commuters on the Peninsula, but it might take a few years. Caltrans officials on Friday will break ground on 32-mile long express lanes on both directions of Highway 101 on the Peninsula. Sen. Jerry Hill was among the speakers at the ceremony. Kris Sanchez reports. Congestion relief could be coming for commuters on the Peninsula, but it might take a few years. 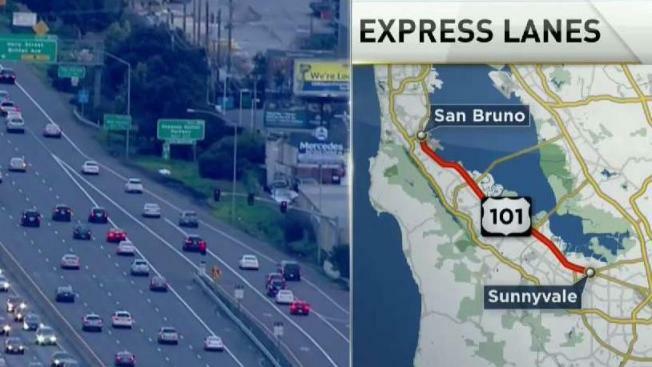 California Department of Transportation officials on Friday broke ground on 32-mile long express lanes on both directions of Highway 101 between Interstate 380 in San Bruno and State Road 237 in Sunnyvale. "The express lanes will reduce congestion in the corridor, improve travel times and reliability, encourage carpooling and transit use, increase person throughput (the number of people moved) and use modern technology to manage traffic," officials said in a statement. The express lanes will be different from the typical HOV lane. Buses and carpools will be able to use the lanes for free while other drivers will have to pay a toll. The $514 million project partially funded by Senate Bill 1 is expected to be completed in 2021, according to officials.